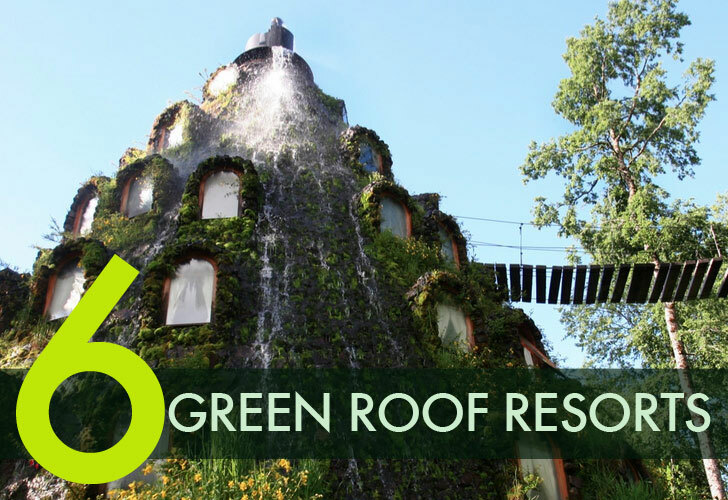 6 Green Roof Resorts from Around the World! 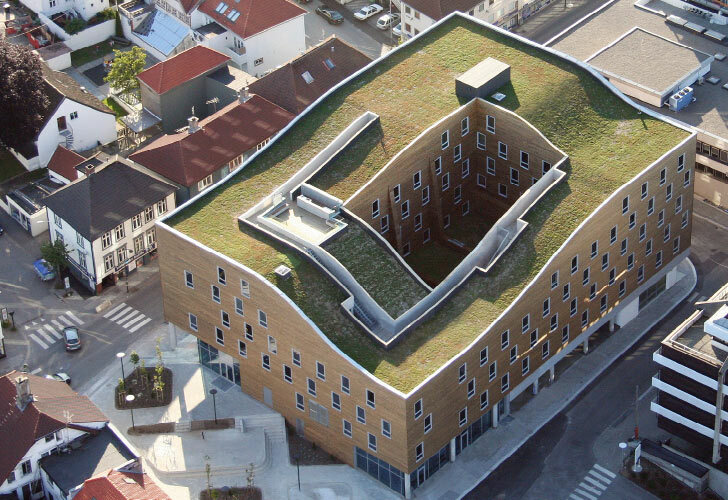 Ok we admit it-- we really love<a href="https://inhabitat.com/category/green-roof/"> green roofs</a>. Sure they have all kinds of <a href="https://inhabitat.com/interview-paul-kephart-of-rana-creek/">environmentally positive attributes</a> -- like how they keep buildings cool, how they control storm water, how they improve biodiversity, and even how they even reduce the <a href="https://inhabitat.com/nasa-photographs-highlight-urban-heat-island-problem/">heat island effect</a>. But the real reason we like them so much is that they just look so great! Rarely does building technology merge so much environmental value and aesthetic quality in one fell swoop. So for a little desktop de-stressing, we've rounded up some our favorite green roofed resorts, which range from a rugged destination if the Swedish woods to a not-so-rough relaxation point perched over a pristine Montana Lake. Hit the jump to see them all! <a href="https://inhabitat.com/magic-mountain-lodge-is-a-hill-like-hobbit-highrise/">Magic Mountain Lodge</a> <br><br> This extraordinary retreat sits in a diverse forest region in northern<a href="https://inhabitat.com/glaciarium-new-iceberg-shaped-glacier-museum-opens-in-patagonia/"> Patagonia</a> and is a base camp at the <a href="http://www.huilohuilo.com/alojamiento/montana-magica-lodge">Hulio Hulio</a> preserve for ecotourists looking to spot a puma or explore the local waterfalls. 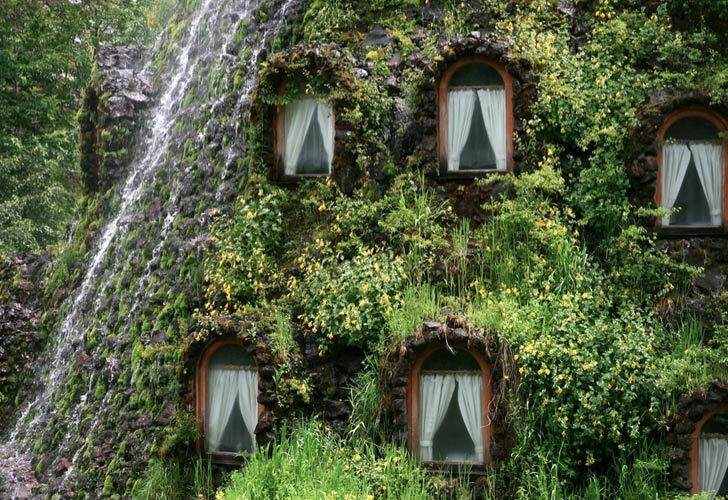 The hotel is cone shaped with dormer windows peaking out of its vegetated and stone façade. A water spot on top pours over the roof, drenching the plants and anyone at the base of the building. The interior is graced with intricate wooden spaces made from<a href="https://inhabitat.com/inhabitat-reader-poll-pick-your-favorite-design-for-the-kimball-art-center-in-park-city/inhabitat-reader-poll-kimball-art-center-proposals-5/?extend=1"> locally harvested lumber</a>. The playful design is intended to evoke an ancient legend that speaks of a magic mountain in the area that grants wishes. <a href="https://inhabitat.com/gorgeous-eco-lodge-built-on-flathead-lake-in-montana/">Stone Creek Camp</a> Perfection in materiality is what comes to mind while looking at the <a href="http://stonecreekmontana.com/photo-gallery/main.php?g2_itemId=42">Lake House</a> at Stone Creek Camp in Montana. Wrapped in a cordwood façade and topped with a grass roof the resort is made from the raw materials of where it lays in style. 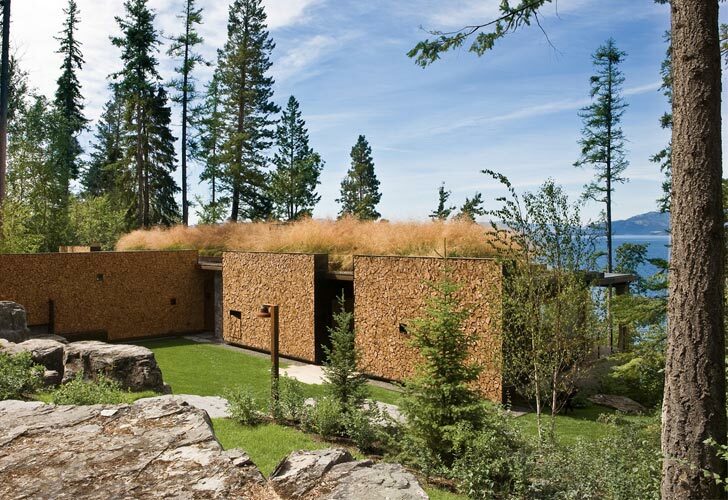 The guest house favors sweeping views of Flathead Lake from a <a href="https://inhabitat.com/gorgeous-eco-lodge-built-on-flathead-lake-in-montana/stone-creek-camp-6/">sleeping porch</a>. The space is really about emersion of design which brings the outdoors in-- and the indoors out. 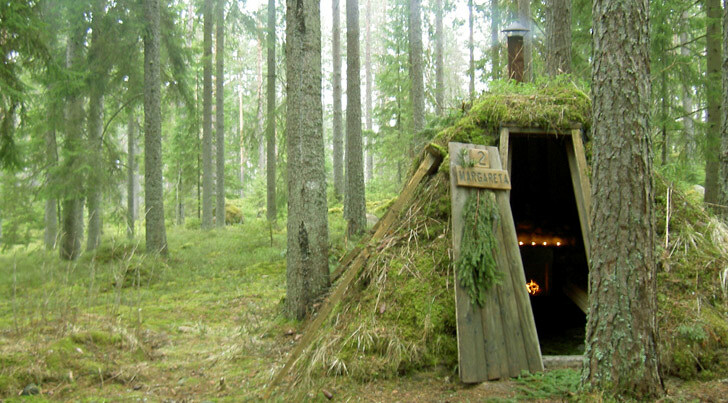 <a href="https://inhabitat.com/grass-blanketed-huts-make-up-swedens-most-primitive-hotel/">Kolarbyn</a><br><br> For some, green lodging is really about communing in the heart of nature. If your pining for roughing it in the Swedish wilderness then <a href="http://www.kolarbyn.se">Kolarbyn</a> will scratch that itch. The simple, powerless A-frame huts are shrouded in ferns, grass and strawberries. A small stove at the end keeps it cozy, but you’ll have to brave the inclement weather while heading to the outhouse. It’s not all about cleansing your mind as a jump in the <a href="https://inhabitat.com/floating-kaluga-sauna-sprouts-a-tree-on-top/">sauna </a>will cleanse your body. <a href="https://inhabitat.com/stylish-h2hotel-features-an-undulating-green-roof-and-a-bevy-of-eco-amenities">H2 Hotel</a> Under this waving vegetated roof is a <a href="https://inhabitat.com/nyc/crosby-street-hotel-is-the-first-leed-gold-certified-hotel-in-nyc/">LEED Gold Hotel </a>and Spa whose<a href="http://www.h2hotel.com/green/"> green vocabulary</a> is verbose. Using native plants to cover 60% of the urban site previously a gas station is now an environmental enhancement for the town of Hereldsburg California. Water is a main theme for the hotel where solar thermal panels heat the domestic H2O and the pool. Water reduction technologies are used for every service including a landscape system that is 2/3 more efficient than typical hotels. The interior is clad in low impact materials and all the amenities a well versed eco-tourist would expect. <a href="https://inhabitat.com/gorgeous-forum-homini-boutique-hotel-cradles-africas-evolutionary-history/">Forum Homini Hotel</a> In the cradle of human's origin is a eco resort that stays true to its origins. <a href="http://www.activate.co.za">Activate Architects</a> developed this hotel on the Letamo Estate in South Africa as a way to express ecological design through the repurposing of deconstructed buildings from the site as well as restoring the ground to its native state. 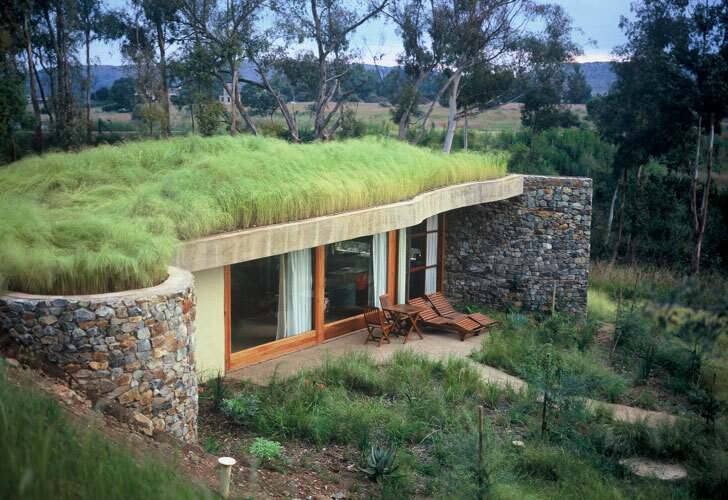 The lush green roof and <a href="https://inhabitat.com/gorgeous-forum-homini-boutique-hotel-cradles-africas-evolutionary-history/activatefeature/?extend=1">high mass wall</a> regulates the indoor environment so well the hotel uses 75% less energy for climate control. <a href="https://inhabitat.com/undulating-green-roofed-hotel-opens-in-norway/">Two Seasons Hotel</a> Built in the center of Stavanger, Norway, atop an existing parking lot the sleek Two Seasons Hotel by <a href="http://www.jdsarchitects.com/index_scroll.html" target="_blank">JDS Architects</a> adds a subtitle ribbon of green to the city. The design looks like a classic building block with a central court for light and air which someone put in a pan to melt and glazed with grass. An observation desk on top lets guest take a peek at the roof. The vegetation also helps keep the <a href="https://inhabitat.com/interview-paul-kephart-of-rana-creek/">building cool </a>and reduces the rain storm runoff-- a huge benefit for the city. Inside guests will find a thoroughly contemporary stay with retail and restaurants set next to the adjacent patio. 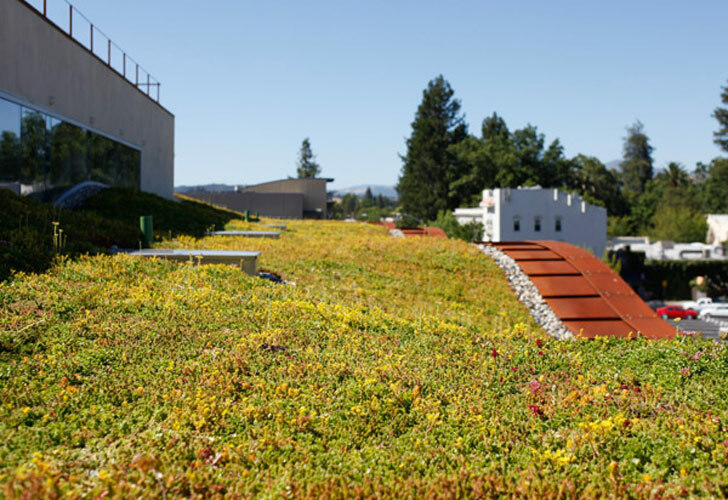 Ok we admit it-- we really love green roofs. Sure they have all kinds of environmentally positive attributes -- like how they keep buildings cool, how they control storm water, how they improve biodiversity, and even how they even reduce the heat island effect. But the real reason we like them so much is that they just look so great! Rarely does building technology merge so much environmental value and aesthetic quality in one fell swoop. So for a little desktop de-stressing, we've rounded up some our favorite green roofed resorts, which range from a rugged destination if the Swedish woods to a not-so-rough relaxation point perched over a pristine Montana Lake. Hit the jump to see them all!